Cooking with whole grain farro is easy. They are in so many recipes out there right now. But what to do with farro flour? On a tip from Maria Speck, I learned that farro flour is very similar to spelt flour in its baking properties; it's very low in gluten and it's an ancient grain. The only difference is farro flour's ruddy color and sweeter taste. 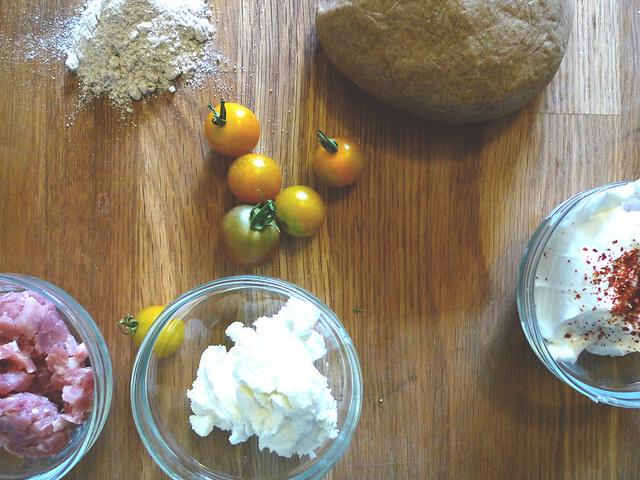 So now you can substitute spelt flour with a local alternative--farro flour. And their are loads of great spelt recipes out there. This basic crust recipe is a slight modification from Maria Speck's Spelt Crust Pizza with Fennel, Prosciutto, and Apples. I replaced spelt flour with farro flour. You can find the original recipe in her book Ancient Grains for Modern Meals. Or an online version here. 1. Put all the dry ingredients in the food processor and pulse. In a separate bowl mix the cheese, milk, olive oil and egg together. Add the wet mixture to the dry mixture in thirds, stopping between additions to pulse everything together. The dough will form into a rough ball. 2. Take the dough ball out of the food processor and knead by hand until it forms a smooth cohesive ball. 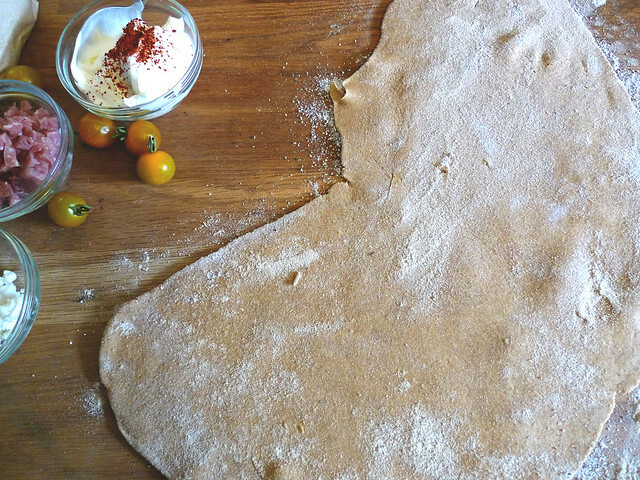 Wrap the dough in plastic wrap and set aside for 30 minutes to rest at room temperature. 3. While you are waiting, preheat the oven with the pizza stone inside to 425 degrees. After the dough has rested, unwrap and split into two even pieces. 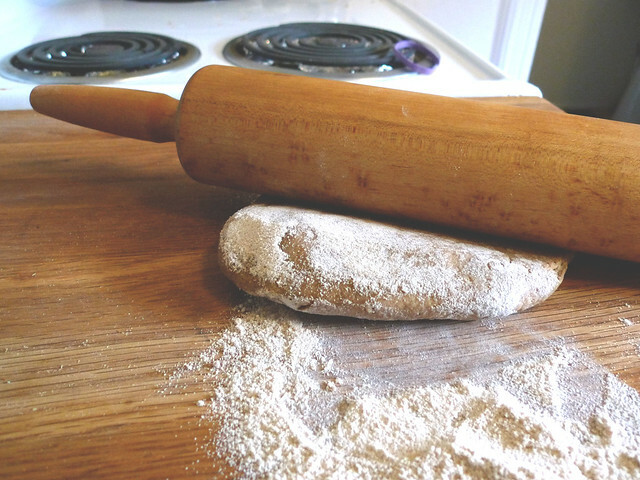 Dust your work surface with flour and roll the dough out until it is as thick as two stacked dimes. Top with whatever you like. (I used what I had on hand, but the original recipe looks amazing). 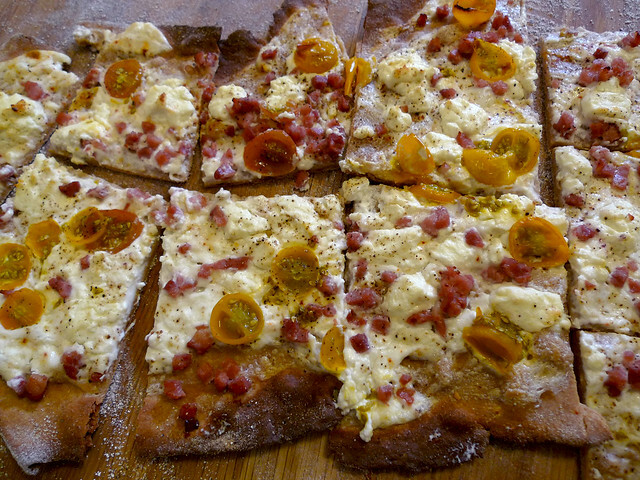 Dust the pizza stone with cornmeal and bake the flatbread directly ontop for 15-20 minutes. Repeat with the second piece of dough for a second pizza. 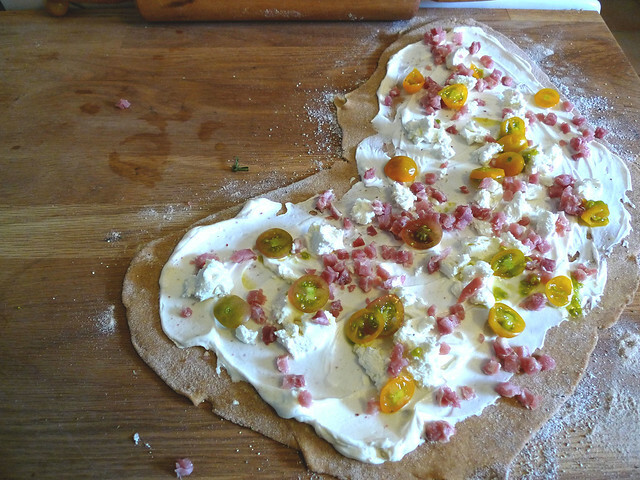 Posted on May 20, 2013 by Emma and filed under Dinner, Recipe and tagged Farro Flour 2013.